Donald J. Trump has made history by becoming the first US presidential election winner not to have served in public office, or the military. #Trump, from a business background, has been chosen by the American people, over a career politician (Secretary of State - Hilary Clinton), as the 45th President of the United States of America. There seems to be somehthing of a parallel with the Brexit vote, a rejection of the stability of the established political status quo in favour of a change. Time will tell how both of these decisions play out, and what impact they have for all of us. I have to admit that I watched all 3 of the Presidential Debates, and I have spent most of the night watching the US election results unfold, not least of all because I had a bet at 5:1 on Trump winning! They seemed pretty good odds for a two horse race, and in the light of the Brexit experience I had a feeling that there might be a similar, underdog victory. The CNN coverage was excellent (despite their own admission that it was a little repetitive in places). What Will Happen Now Trump Is President - Trade Prospects With The UK? If you knew nothing else about Trump, other than hearing his victory speech, you would possibly be reassured, and perhaps even intrigued as to what he will do next. Especially as the Republicans have control of both the Senate and the House of Representatives to make changes happen. However, I know from the coverage that many people have concerns - as was the case with the Brexit vote. Lets try to stay postive and see what happens. Doom mongering isn't going to help anyone, except perhaps those that have bet against the stock market. Lets hope he can inject some more properity into the US economy, he is promising to rebuild US manufacturing. I would love to see, and finance, more trade between the UK and the US - whether UK exports or imports. 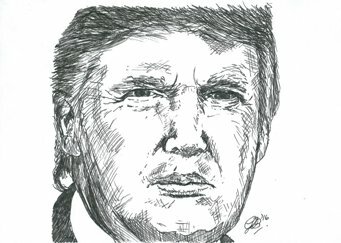 So here is my own 10 minute sketch of the new "leader of the free world" - Donald J Trump. <a href="https://www.fundinvoice.co.uk/blog/news/post/trump-wins-us-presidential-election.html" ><img src="https://www.fundinvoice.co.uk/images/trump.jpg" alt="Donald J. Trump by Glenn Blackman" width="450" /></a><br /><a href="https://www.fundinvoice.co.uk/blog/news/post/trump-wins-us-presidential-election.html" >Donald J. Trump</a> by <a href="https://www.fundinvoice.co.uk/" >Glenn Blackman of FundInvoice</a>.